I love bringing passion, energy, and practical application to school leaders, while always tailoring the workshop to fit the needs of your organization. Keynote addresses, workshop sessions, administrator training, are all available to move your district forward. Follow up consultation is always included. Send an email to jessica@principalj.net to get started. Descriptions of all sessions can be found HERE. Coach Approach PD can be tailored to be full day, half day or 60-90 minute sessions, varying on the needs of your organization. Join co-authors of The Coach Approach to School Leadership (ASCD, 2017) as we dig into one of the most vital and challenging aspects of educational leadership - giving impactful feedback. You will leave this session inspired and equipped with a Coaching Hat to improve the learning in your building. Principals wear many hats and we strongly believe the most important is the coaching hat! No matter what evaluation system is used by a school/district, the overall goal is teacher effectiveness for improved student learning. Coaching is a valuable practice to improve instruction and learning and is shared as one of the “hats”, and most important hat, that leaders can wear while leading. In this session we will introduce the concept of the “coaching hat mindset,” which is the heart of the book The Coach Approach to School Leadership: Leading Teachers to Higher Levels of Effectiveness (ASCD, 2017). We will explore why instructional coaching approaches are vital, as well as how to shift from primarily being an evaluator/manager to being a learning leader utilizing coaching techniques. This session will be interactive and practical to inspire and prepare principals to lead with a coaching hat. Join co-authors of The Coach Approach to School Leadership (ASCD, 2017) as we dig into one of the most vital aspects of educational leadership: transforming your school into a culture that embraces continued growth through continuous learning and coaching. 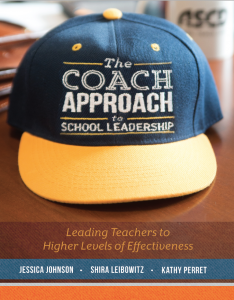 Enter the #CoachApproach where school administrators and teacher leaders can model the way. Let’s explore ways to create an environment of peer to peer observations, coaching conversations, and trust. Participants will be introduced to The Coach Approach and how school leaders can transform schools into a learning team by developing a variety of approaches that lead to more peer to peer observations, reflective dialogue and coaching. Join us to practice a variety of methods used to spark coaching conversations between principal and teacher, coach and teacher, and teacher and teacher. In order to lead with a Coach Approach, you must be able to manage all of the “stuff” that keeps you from getting out of your office and into classrooms where the learning happens. Join co-authors of The Coach Approach to School Leadership (ASCD, 2017) as we lead you through ways to better manage your calendar, to-do list and many “fires” you are called to put out. Participants will walk away with strategies/tools to implement proactive systems that allow you to maximize time in classrooms while keeping up with all of the other “stuff” and NOT bringing all the paperwork home at night! Join proven leaders for a high-energy, engaging, interactive, inspiring and impactful program that will reignite your passion to lead. Sessions below can be presented as a keynote, breakout session or be extended into a full day workshop to transform lives. 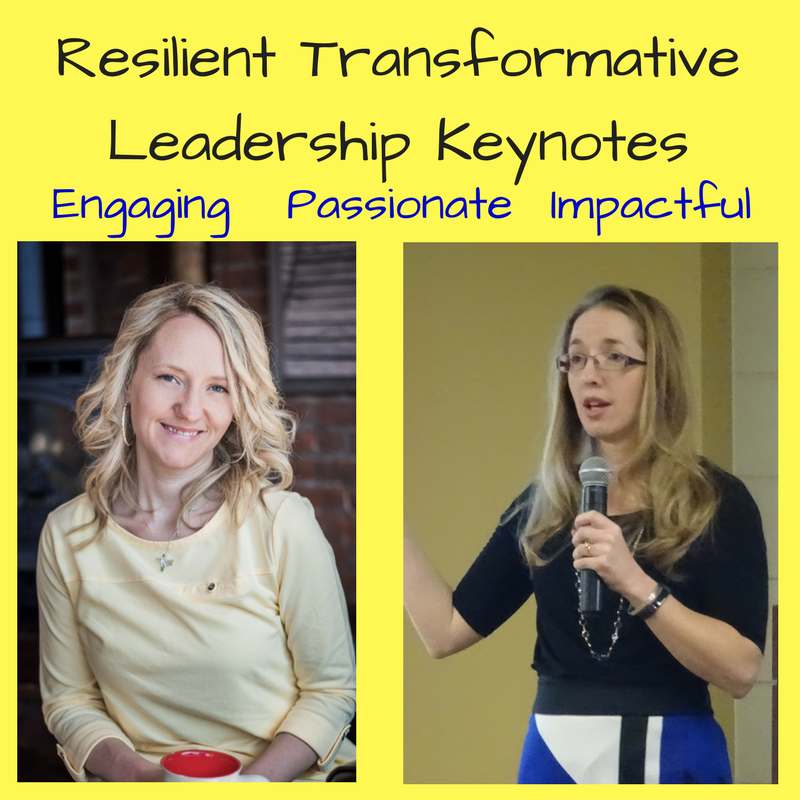 The Keynotes Below can be given alone or with Sarah Johnson, my partner in Resilient Transformative Leadership. There’s no question that every school leader faces challenges on the job with ever increasing demands that lead to stress and put us all at risk for burnout. School leaders often define themselves through servant leadership, tending to put others’ needs above their own and even end up sacrificing much of their personal time for their careers. We are convicted in our belief that leaders cannot take care of others without also taking care of self as we cannot pour from an empty cup. This keynote session will inspire school leaders to examine where they are pouring energies and draining themselves out as well as where they can make room to reignite flames in their lives that have fizzled. A critical outcome from this session is for leaders to see that they can be the best versions of themselves by seeking balance at home, work, and life. Attendees will leave feeling relaxed as well as empowered to take intentional steps toward a more fulfilling balance. We commit to our participants to be able to return to their school re-energized to lead the way. Women carry a variety of titles and those of us in leadership understand how competing they can truly be in daily life. Wife, Mom, School Leader, Sister, Daughter, CarPool Chauffeur, and Friend...Let’s be real...even if we are fortunate to have partners who also work, it seems women tend to carry a substantial and heavy load at work and home. If we are not mindful, the variety of spaces in which we pour ourselves out can lead to identity crisis! Too often we find ourselves spinning through life and suddenly realize we have forgotten the title that preceded all of the rest. Self. Being a school leader is a challenging role for anyone, yet trying to balance it all as a woman in leadership is a layer that only women fully understand. This keynote session on seeking balance to thrive in leadership and life will leave attendees feeling rejuvenated and ready to rock those titles! We all have personal stories that ink the pages of our lives and develop the plotline for how we came to be in our profession. With the same last name but not related, Jessica and Sarah share personal stories that illustrate how even childhoods that paint an unlikely picture for success can transform into dynamic leaders in adulthood. This session highlights how kids who grow up in homes with abuse and neglect can become resilient leaders. The session weaves personal story, relationship building tips, research, culturally responsive practices, and bold acts of caring encouragement. Attendees will walk away inspired to champion for their students to become future resilient leaders.